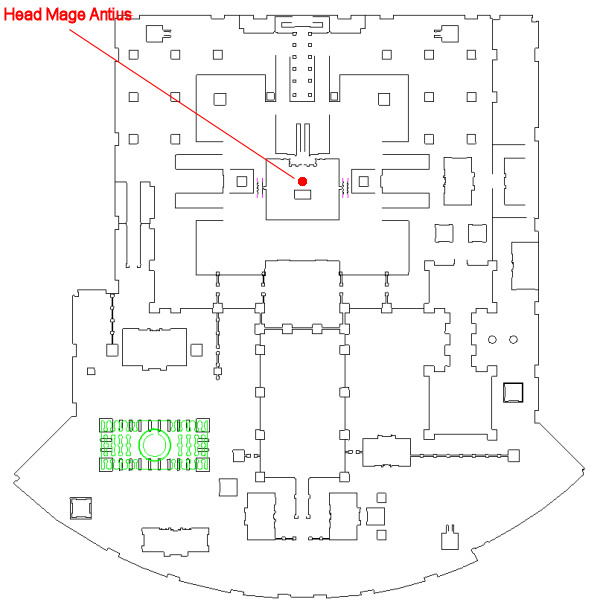 This solo task begins with Head Mage Antius (click for map image) in Katta Castrum: Deluge. WARNING: as of late 2015 we are getting some unclear feedback about prelooting items for this quest --it appears this may no longer be possible? Say "fragments" to request the task. Simus the Doomsayer cackles gleefully as you approach. His blood shot eyes betray a long lack of sleep. 'The waters come _____! Just as I said they would! The dark serpents of Prexus' cold encroaching waters come to engulf this city of fools and liars! With each new crack in the Pellarus my vindication becomes more assured! All those years of mockery end in a crescendo of inevitable destruction! Flee _____! Flee while you still can! Hahahahahaha!' He continues to laugh uncontrollably as spittle flies from his open mouth. It would likely be best to back away slowly. The ground beneath your feet trembles and small bits of debris rain down from above. You hope that it was merely from some nearby stonework and not the dome above you beginning to collapse. Head Mage Antius grimaces with concentration as you approach. He's clearly incredibly fatigued. His eyes widen slightly as you approach and address him. 'Someone from the surface? How did you get down here? The portals are all broken and they shall remain that way until we can find a way to fix the [Pellarus]. You have been assigned the task 'The Pellarus Satum'. The Pellarus Satum must be repaired if the city is to be saved. Work with Head Mage Antius to repair the artifact. 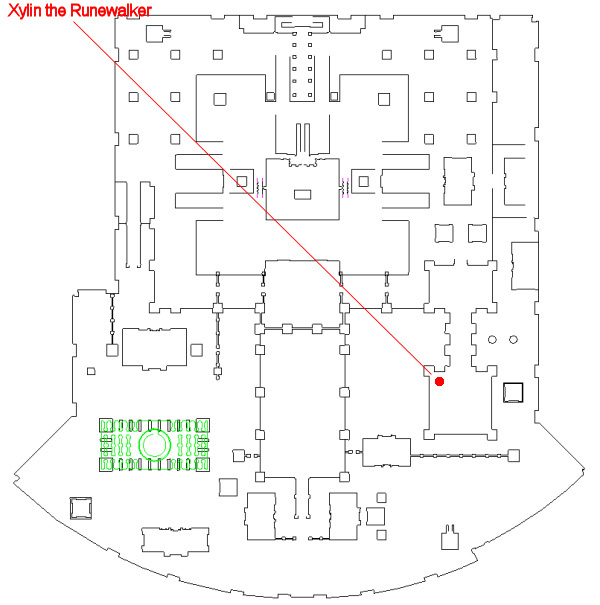 You'll encounter two named shissar: Overlord Salazin (click for map image) for Captain Parvus' Signet (near the tents just south of the temple), and Xylin the Runewalker (click for map image) for the Teleport Research Journal. You'll repair the Solteris portal, located next to Researcher Chlearpa (click for map image) in the northwestern corner of the main floor of the temple. Next to the Solteris portal, you'll encounter an Efreeti, the Sun Guardian, in a close-quarters fight to finish. Task Window Says: Antius needs a collection of fragments that were sundered from the Pellarus. The Head Mage believes he saw them scattered across the city when the torrent damaged it. He also said that the guards reported finding a few while fighting the shissar and the elementals near the temple. "Pellarus Fragment" is an uncommon drop from shissar and elemental mobs in the zone (they don't seem to drop from mobs inside the library, but will outside and underwater). You receive "Bundle of Pellarus Fragments" (keep these on you). Task Window Says: Speak with Researcher Chlearpa about fixing the teleporter that leads to the Pellarus. Researcher Chlearpa says 'He sent you to help? I find it unlikely that you can, unless you have a firm grasp of Lunar convergence allegories and plate tectonic schisms. Actually...that gives me an idea. If I had a set of elemental cores to siphon the planar gelatanim from I could use that to... But then I'd still need an arch arcanist's rune pattern set to attenuate to... Blast! Come now, Chlearpa, you'd still never get past the captain's protective magnasetic inversion...' She continues to mumble about 'teleportationary' theory as your eyes glaze over. You think you might have caught enough to be able to provide some of the items she's looking for. 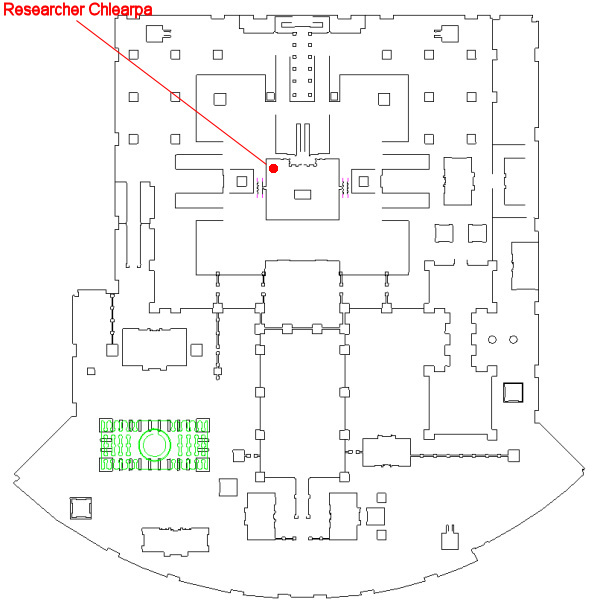 Researcher Chlearpa (click for map image) is found in the northwestern part of the room, the same room as Head Mage Antius. This opens up the next six steps. The Rogue Elemental Cores are prelootable, others have not been confirmed yet. Task Window Says: Chlearpa needs a number of magical items to repair the teleporter. Bring them to her and hope that she wasn't making up all those strange words she was using. Overlord Salazin (click for map image -- near the tents just south of the temple) and Xylin the Runewalker (click for map image) drop "Captain Parvus' Signet" and "Teleport Research Journal", respectively. Neither are difficult mobs, and are on 12-minute respawn timers. Both nameds are immune to stuns, but mezzable and rootable. They each hit for a max ~13,500 and do NOT summon. Task Window Says: Speak with Researcher Chlearpa to activate the teleporter. Task Window Says: Miraculously, Chlearpa was able to repair the teleporter. Use it to reach the Pellarus and find Praecantor Jumais, one of the artifact guardians. Use the portal next to Researcher Chlearpa, and hail Praecantor Jumais (he doesn't respond). Task Window Says: Jumais doesn't look too good, but he believes he can handle the Pellarus repairs if you give him the bundle of fragments. You'd best be ready for anything when you hand them over. Be ready for mob aggro. Hand him the "Bundle of Pellarus Fragments" you received earlier. Praecantor Jumais takes the bag from you and pours the shards into his hand and smiles. He props himself up on one elbow and begins chanting over the fragments as they begin to glow and pulse along with the rhythm of his voice. The sound reaches a crescendo as the shards seem to melt from his hand and fly towards the artifact. They circle several times before bleeding into the cracks on the orb, sealing up much of the damage, though several cracks remain. A flash of light pulls you back to reality as a minion of the sun phases into existance in front of you. It does not look happy. "a sun guardian" spawns right next to Praecantor and aggro's. Like the previous nameds in the task, it hits for a max ~13,500; is immune to stuns, but mezzable (unknown if rootable). Note that there isn't much room to move about in the fight area. Note: You can heal players in the fight area while standing at the portal in the main room of the temple (mercenaries will not heal from this distance, however). This task is repeatable with a 6-hour lockout timer from the time of request. Neither fight was an issue for a 108 Wiz + J5 tank and a 100 Bard + J5 cleric. Xylin the Runewalker can be fought right on his spawn point and nothing else should aggro. For Overlord Salazin, I setup in the only corner near him without a nearby mob. The Bard was able to pacify the two mobs next to Salazin and then pull just him to the corner. If you can't pacify I think you will likely need to take the named and one regular shissar at the same time. Also, prelooting the cores worked fine. I turned them in to my merc, who promptly returned them and gave me the task update. Using the steps outlined below, our group did this task today and pre-looted the cores - handed them to an npc and got the update when he handed them back. So it seems they are pre-lootable when we did this task today. Any pre-looted item needs to be handed to any NPC and then CANCEL the trade. This will update the task for "looting". Just took new boxes through this quest and pre-looted fine. After delivering four  Pellarus fragments and receiving appropriate dialogue replies, instructions say to hail Head Mage Antius. This does not advance the task and I am not getting: "Head Mage Antius places the fragments inside a small leather satchel and hands them back to you. 'Well, that's one problem down, but unfortunately not the last. The portal that leads up to the top of the temple ceased to work when the Pellarus was damaged. It will need to be fixed before we can attempt a repair. Chlearpa is the only surviving researcher with any knowledge of how these portals work. Go and assist her with the repairs. Hurry _____! We can't keep this dome up forever!' "
If you do pre-loot all the pieces, you can just hand them all to Artisan Antemm right next to Researcher Chlearpa. He'll of course say "I have no use for these items you can have them back", and you'll get the items back + the updates. You can then give the items to Chlearpa. 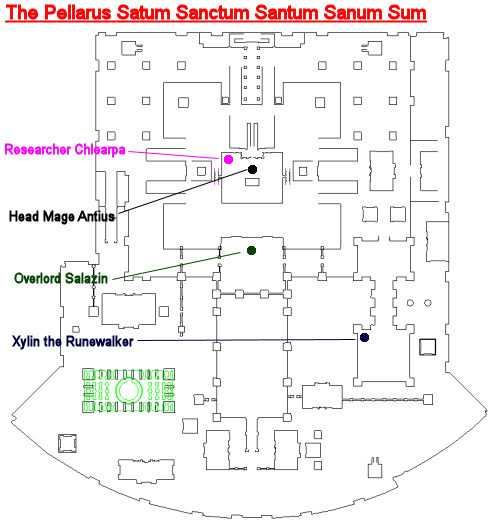 First, as indicated below, it is indeed called the Pellarus SATUM --->>NOT Sanctum! There are comments here about "pre-looting" the quest drops. This means acquiring them even before the mission instructions appear telling you to do so. Yes, you can BUT you won't get credit for the acquiring step, EVEN IF you do for the turn-in step. However, I did find if you acquire ONE of the quest items AFTER you have the appropriate instruction, you will get credit for ALL in your inventory. So if you want to save time you could collect 3 of each presumably even before starting the mission (not sure if they drop during normal grinding, though, I didn't bother to test this) but at least you don't waste the pre-looting effort this way. Just have your tank do the hand-in and grab agro on the sun warrior. Maintain agro without killing it while the other toons in your party do their hail and hand in (it won't spawn additional sun warriors). Once all the toons are on the "kill the sun warrior" step, then go ahead and kill it, all toons will get credit. just a heads up. if you plan on boxing this one, its fairly easy, however all chars have to be up to the step "Speak to Praecantor Jumais"
unsure as to chars that have previously completed it already. also the sun guardian does not see invis. and pops right where you come in thru the portal. tried throwing a trap down with the Rogue that was in group to buy time to get him mezzed so everyone could hand in but the Praecantors kept trippin it no matter where you stood. easy fight as well. Just kill elementals in the water (a darkmud slave) etc they drop both 2-4 at a time. My experience was not uncommon -- of the listed mobs, dropped far more often than not. Same with the Rogue Core's, quite common. If you have more than one person, turn in the bag all together for just one sun god fight at the end. I did it with just one turn in first, and we had to fight it a 2nd time. Then the other 2 turned in and they both got credit for the one kill. Lock out timers changed on Test 10/13/14 cut in half, 3 hours now. No, it's still 6 hours. Heroic Adventures had their lockouts cut in half. He resisted my shammy's Virulent Paralysis twice, so I'm gonna go out on a limb and say he isn't rootable. This task is "THE PELLARUS SATUM" (not Sanctum) per my task window. You can pre-loot, it wont update the task step BUT if you hand in the 4 cores to your merc and DO NOT click trade, just hand and cancel; you'll get the step update.